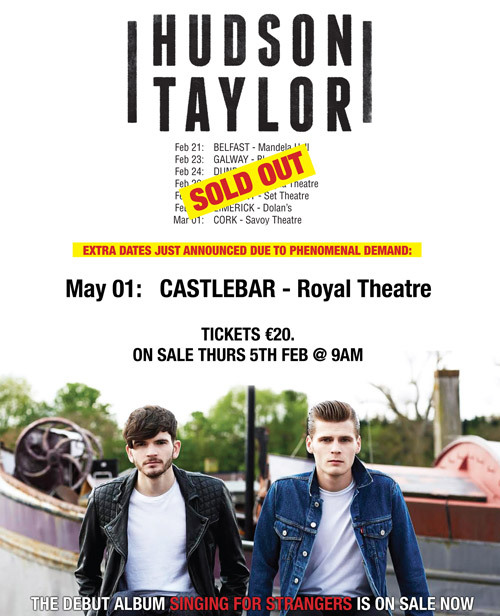 Castlebar - County Mayo - Hudson Taylor to stop off at The Royal Theatre! EXTRA DATES ADDED TO IRISH TOUR. DEBUT ALBUM ‘SINGING FOR STRANGERS’ OUT NOW. Having just sold out their biggest tour to date, Hudson Taylor have added an additional seven Irish dates this May. This will include a very special show at The Royal Theatre, Castlebar on Fri 1st May. Hudson Taylor released their debut album 'Singing For Strangers' to critical acclaim in Ireland this month and will celebrate it with a sold out Ireland and UK tour. They will release their new single 'World Without You' in March. Tickets (€20) go on sale at 9am this Thursday 5th February. Tickets In-Person: Royal Theatre Box Office, Westport Road, and Ticketmaster outlets nationwide.